We have been working the past few months on Appsdeck. This article describes the different functionalities which are currently working on the platform (we’ll talk later about our current roadmap to the beta testing phase). Buildpacks and Procfile support works now. If you’re not familiar with these terms, we’ll explain them now. When you git push your code on Appsdeck, we package it into a container, then we run a set of scripts to detect the language you’re using and to install the required dependencies. That is a buildpack. It means that we virtually support any languages or framework. However, during the beta test phases, we’ll limit the number of buildpacks you can use and we’ll only support Ruby/Rails, NodeJS, Python, Go, PHP, Java and Scala (which is quite a lot anyway! ), but any other technology will just be a buildpack away. The Procfile, which is just a simple text file at the root of your project source code, let you define different kinds of processes you’d like to see running on Appsdeck. By default, we define for you a “web” process, then you can define your own kinds of processes like “crunchers”, “crawlers” or “workers”. 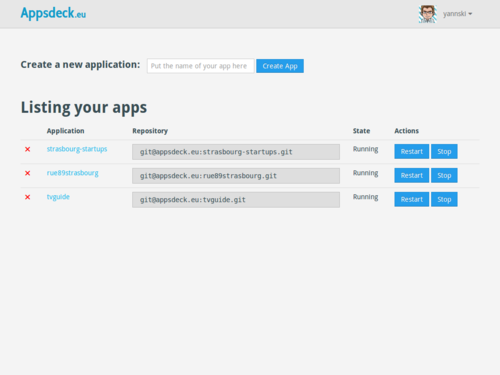 The Appsdeck platform also has its own public API and we have a first version of a command line client that you can use to do the previous 6 tasks. With this command line client, you can also “run” command in your project: we launch a one-shot container that will live as long as your command will last. You can use it to fire one-shot commands like rake tasks or launch a bash. Yep, that’s a full bash running in your environment. So you could ask, what’s missing? Because we care about the efficiency and the security of your data, we think that it’s important that storage engines should be part of the platform (unlike Heroku). We’ll focus primary on MySQL, MongoDB and Redis. This is what we’re working on now. 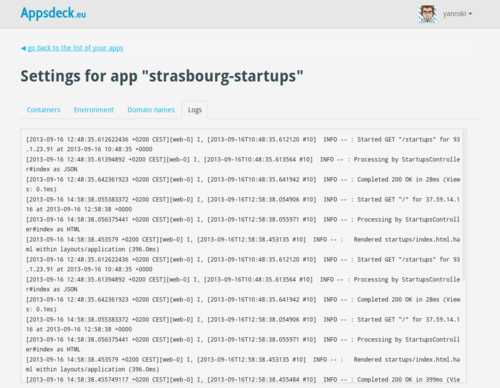 BTW if you’d like to use Appsdeck and need another storage engine, just let us know → hello@appsdeck.eu. We think that we’ll be able to open a private beta during the months of October and November, a public one from December and we’ll then incorporate the company in January 2014 (at the latest).